Hammertoe is a deformity that causes the middle joints of the toe to become stuck in a bent position, creating a resemblance to a hammer. 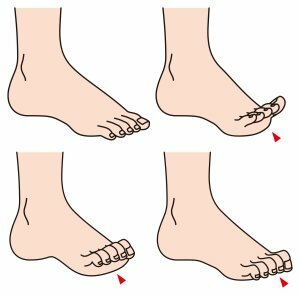 This deformity usually affects the second, third, and / or fourth toes. Hammertoe is often caused by muscle imbalance and the use of shoes that don’t fit properly. The development of hammertoe often results in calluses or corns forming either on the top the affected joint, or on the end of the toe, which can make the condition even more painful. Surgery is usually required when the toes become so bent that they have lost of lot of their flexibility. If you have hammertoe, make sure you look into the treatments options that are available to you! Eric J. Lullove, DPM, our podiatrist in Coconut Creek, can help you determine what the next steps are for correcting your toe joint deformity. Call Eric J. Lullove , DPM today at (561) 989-9780 and schedule an appointment! We serve patients in the Coconut Creek and Palm Beach County areas, and we accept most insurance plans.